Flower and gift deliveries to the Dayton, OH area for nearly 45 years! All products including quality fresh flowers and plants come with our 100% Satisfaction Guarantee. We are Beavercreek's only Florist and provide quality Floral Designs Sympathy Afghans, Garden Stone Angels, Gorant Chocolatier, quality Wind Chimes and much more. Our shop has been located a half mile from the Fairfield Commons Mall, just two miles from Wright State University. In the same location for nearly 45 years. To thank those who serve, the shop offers a 10% military discount on local orders. Fresh, beautiful flowers and designs fill our cooler everyday but we cannot show you all our selections here on the site, so please call us. Toll free: 1-888-216-4253 or locally AT 426-4253. Store Hours: Monday - Friday 9:00 am to 5:30 pm, Saturday 10:00 am to 4:00 pm. Closed on Sundays. 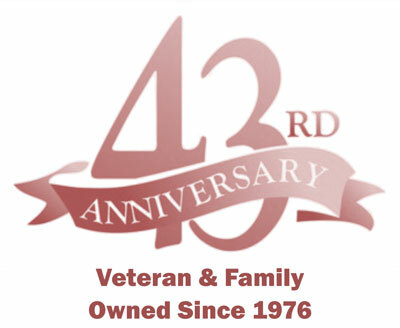 As a family owned business for 40 years, we work hard every day to ensure your satisfaction. When compared to all other ways to purchase fresh flowers; grocery stores, 1-800 numbers, street vendors, etc, we feel that we can best handle your floral and gift needs. Dollar for dollar, we truly offer you "Affordable Flowers for Priceless Feelings." We deliver daily to the surrounding area including most of Dayton, Fairborn, Kettering and area hospitals. For out of town orders, with Teleflora and Beavercreek Florist, your order is always sent with a 100% Satisfaction Guarantee, anywhere in the U.S. and Canada. We help people to make a special delivery when sending flowers, plants, stone angels, wind chimes and other gifts as well as balloons or Friesinger’s fine candy. The collection on our site offers a variety of styles and prices making it simple to send flowers appropriate for the occasion & priced right too. Call us today TOLL FREE at 1-888-216-4253 or order Online by using the pull down category menu at the left side of each page. 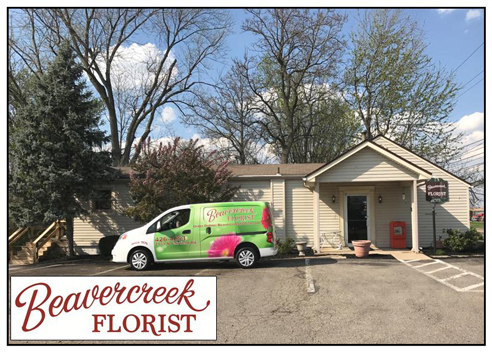 "Affordable Flowers for Priceless Feelings" is our motto at Beavercreek Florist. We work hard to bring you the most beautiful, colorful and long lasting arrangements possible. Dealing with only the best wholesalers in the industry, we can deliver the highest quality flowers your money can buy arranged by a trained staff of professional designers. There are many places that you can pay less for flowers and through 1-800 numbers, places you can pay much more, but dollar for dollar, we truly believe that every day we offer the most "Affordable Flowers for Priceless Feelings". 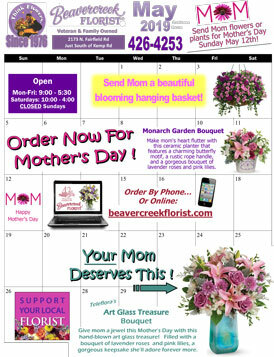 At Beavercreek Florist, we help to make the gift of flowers, plants or balloons special. The collection on our Internet site offers a variety of styles and prices making it simple to choose and send flowers that are both appropriate for the occasion and priced right too. The selections on our site are somewhat limited though, so please call us for special requests toll free. Call us today TOLL FREE at 1-888-216-4253 or to order Online, select a category above and select 'Search'. Most people think that 1-800#'s are OK to use for convenient flower deliveries and gift ordering. In reality, even using their $$ Off Coupons, they cost you more and complicate things for you if there are problems. to take your order because they don’t to clean, arrange or even deliver your flowers… They don’t even own a cooler. You reached a ‘Call Center’--NOT a real florist. and frequently con artists praying on consumers’ naiveté in order to make a buck. They simply send your order, via phone or computer, to the delivery area and a local real florist (usually NOT us since we do not accept their orders ) makes and delivers the arrangement. They keep the outrageous “service fee” that you pay. Incredibly, they get percent of the order value AND a rebates of up to $4.95 from the wire service AND a percentage (usually 7%) is taken out from the order to the wire service as well. The local florist who receives that order is then obligated to fill to the flowers to full value, and frequently does so at a loss. The service fee they collect is as much as $14.99 ! They also typically charge you way more for balloons, candy or other add-on items too! Yep, that’s why we send your orders through Teleflora for just $5.95 when you call us. Our entire $8.95 delivery goes to the other florist on your behalf so money is not taken out from the flowers. Floral order and 1-800 senders may send $3.00 of the delivery/service fee, ( OR NONE ) just pocketing the rest! So call us when sending local OR out of town. We’ve been serving you 40+ years.